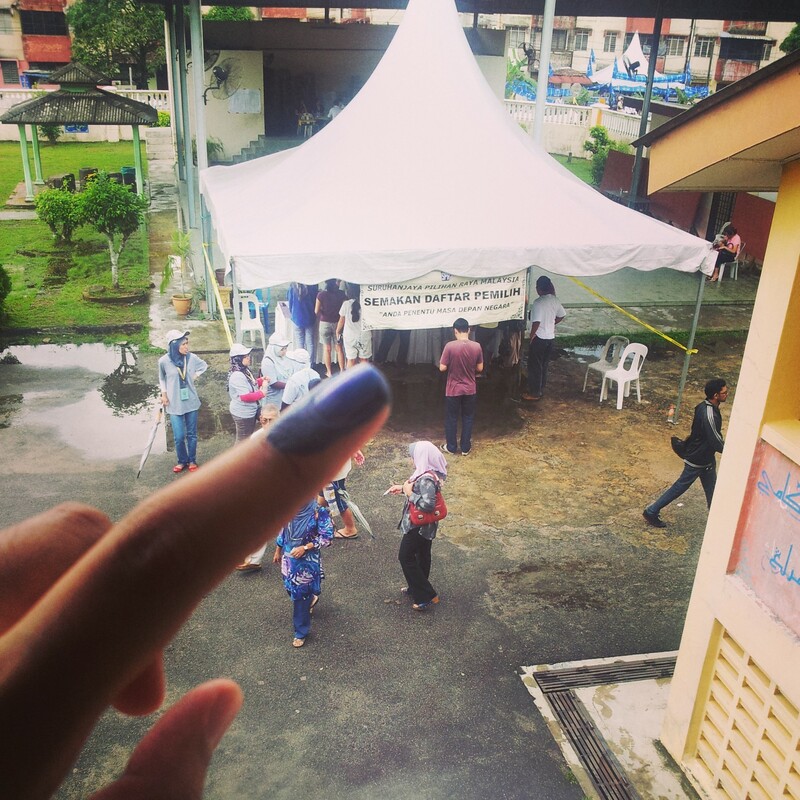 So, on the 5th of May 2013, Malaysia had its 13th General Election & this is my first ever election. Never bothered in the 2008 elections because I wasn't really keen on politics back then (was too busy studying I guess). My mum was scheduled to go to Taiping, leaving the cats alone. So I had no choice but to go on the day itself before returning later on the same day. Guess what, my mum didn't go. duh! Well, took off after Subuh prayers, that would be around 6.30am, so sped like hell. Maintained 200km/h+ for about 10km before "Slow Down" warning came out. I guess the CVT was overheating, darn it! 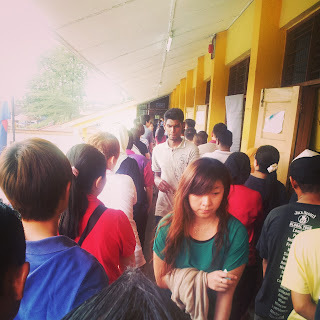 Upon arrival at the Sekolah Agama, the line was LONG! really long! Maybe about 100 people estimated. So, i stopped by at a friend's house nearby. Chit chatted with the family before a massive downpour. So the strategy was we should go then, less people would be queuing up. Well,in a way, it was right strategy. But, due to the rain, the original "line" was scrambled. So we ended up queuing in a tent for "Semakan Pendaftaran Pengundi". When in fact, if you already printed your slip, you can just skip this part & straight away queue up at your Saluran. From the picture above, you can see 2 lines, on the right is Saluran 5 while on the left is Saluran 6 (which was mine). Honestly, I really like the first polling officer in Saluran 5 because he was following the guidelines by the book. AS in he checked our hands for smudges, fingers for any marks, and even his voice is loud & clear. Unlike the one in Saluran 6, he never even bothered to check. In fact, the 2nd officer with the ink also never bothered to let my ink dry first. This simple method of not asking the voters to "blow" air to let the ink to dry, may be one of the factors why there are complaints about the ink being easy to wash off. Think about it, which is easier to clear off, dry ink or wet ink?